A Nutrimix cheque for $270,000 paid to General Earth Movers for infrastructural work to facilitate the laying WASA's pipelines in Brechin Castle, Couva. A CHEQUE for $.2 million has debunked a social media post by United National Congress activist Devant Maharaj that Nutrimix had gotten a free water connection to the tune of $.5 million. The cheque was shown to Newsday on Friday. Nutrimix’s vice president Ronnie Mohammed and Water and Sewerage Authority (WASA's) chairman Romney Thomas, in condemning the release of WASA documents, said the water connection development in Brechin Castle, Couva, where Nutrimix had built a state-of-the-art hatchery, was in fact a joint corporate effort by WASA and Nutrimix. Thomas said the project would redound to the benefit of scores of ex-Caroni workers in their respective agricultural lands. Both denied any $.5 million waiver by WASA as alleged by Maharaj, adding that the water development project lines are on state lands and not Nutrimix’s private property. Mohammed is also chairman of Caribbean Airlines. However, a cabinet note dated February 9, 2015, obtained by Newsday, revealed that an application for lease of the lands was considered and granted in Nutrimix's favour. On September 3, 2015, when the People's Partnership government was in power, the lease agreement was signed over to the company. In addition to the social media post, Maharaj sent the Integrity Commission chairman Melville Baird documents and a letter claiming Nutrimix had been given a $.5 million waiver by WASA for the water main. None of the supporting documents speak of a waiver. Rather, a letter dated July 25, 2018, from Denise Lee Sing Pereira, WASA’s director of programmes and change management, to director of operations Sherland Sheppard said on completion of the water main project, WASA would retain full ownership of the assets. 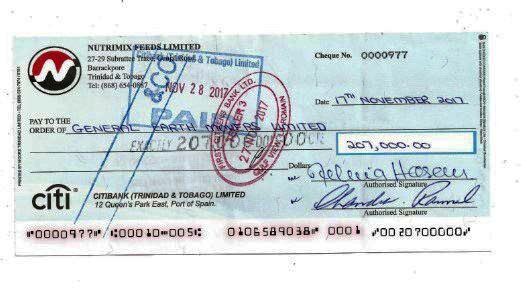 A cheque dated November 17, 2017 from Nutrimix for $207,000, was made payable to General Earth Movers Ltd, backed by an invoice, to facilitate installation of the water main on the leased lands. When contacted, Thomas told Newsday WASA's objective in entering into a corporate arrangement with Nutrimix was the benefit that would be derived for the surrounding communities in the Couva south constituency. “So it was a two-fold purpose. And I can say that to date, the company has not had connection. Again, the company provided the resources and the authority – the technical support for which we retain full ownership of all the assets. he mains being spoken about is along the public road for the benefit of the communities there as well, in the long run." Reply to "WASA, Nutrimix deny Devant’s ‘free water’ post"